Most marketing teams are now being measured on their contribution to revenue, but to track this impact accurately companies need to track the dynamics of the buying process over time. Nearly 90% of B2B marketing organizations used content marketing in 2012 – more than SEO, events or traditional advertising. 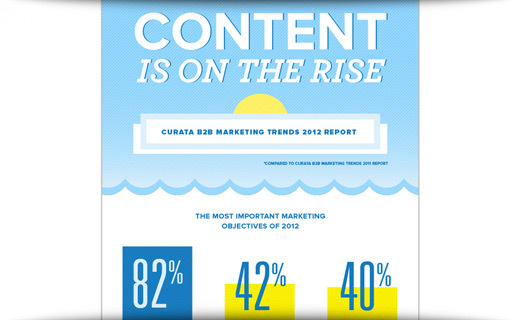 These and other 2012 content marketing trends are illustrated in this week's infographic, provided courtesy of Curata. One way to measure the quality of a business conversation is by the way your prospect talks about you once the discussion is over. In other words: Yes, you want them to talk about you behind your back. But you want those conversations to portray you in a positive light. Great coaches win consistently because they develop great strategies, design winning plays, enforce the fundamentals and execute for results. SiriusDecisions yesterday unveiled an update to its proprietary Demand Waterfall, a model designed to unify sales and marketing teams and to establish closed-loop processes. The research firm shared the new model at the SiriusDecisions Summit, held this week in Scottsdale, Ariz. The new model focuses on managing leads sourced across a variety of channels, including sales, marketing and teleprospecting. DemandGen Report (DGR), a targeted e-media publication covering strategies and solutions that help companies better align sales and marketing, is honoring 10 BtoB organizations that have utilized automation tools and tactics in its third annual Sales & Marketing Alignment Awards.